I'm writing this Sunday Morning and I am editing it Monday Morning. The storm has come and it is lingering, but nothing more than a random shower. Basically a normal Monday in the wet season. Sunday Morning, I was awakened by the sound of gravel being thrown against the storm shutters that are bolted to the bedroom windows. It actually was a squall line coming through. We had been having rain for about a full day at that point, off and on. The rain had stopped as quickly as it started. One of those Hollywood Movie Set things where some unseen stage hand has flipped a lever on and off. Hauling myself out of bed to check radar, I get started feeding the dog. That in itself takes time since she has to have soft food, and doesn't like that at all. While I'm sitting in a kitchen Captain's Chair, scooping wet and warm dog food out with my right hand and proffering it to the recalcitrant pooch, another line hits. I knew it was here when Oscar flapped his wings and said hello, then laughed. There is no joy quite like a parrot who thinks he's going to dance among the rain drops. I finish feeding Mrs Dog thinking we're going to get wet. Listening for thunder, and hearing none, I grab my portable lightning rod. When the winds gust over 30mph, the umbrella would be useless. I knew that. She walks between the cars and over to the lee of them to empty out. Any other Sunday at that time she'd avoid that spot. The irrigation had started and the sprinklers were adding to the wet. Hmm, got to fix that Rain Sensor. For now, the water we were pumping out of the ground was watering the grass, about a block away once it stops being pushed West on the gusts. We headed out to the street. Not as bad as it could be. The rain had almost stopped. As she went to do her business, a gust of wind caught her as she was balancing and she went down in a stumble. It was an interesting couple of days. Not as bad here as in Key West or when it eventually makes landfall up in the Gulf, but interesting none the less. At this point, the storm is in the Gulf and strengthening. It is forecast to make landfall somewhere around Gulf Shores Alabama or westward toward the mouth of the Mississippi. Lets hope it doesn't turn into another Katrina. That picture pretty much says what it did to us. 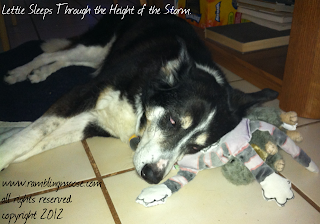 The dog slept through it all, once or twice getting up and sniffing the air, then using her toys as pillows. No Big Deal. It could have been worse, and will be when it makes landfall as a Category 1 or 2. The best thing it did was to fill my pool and wash away some used tea bags in Tampa at their Republican National Convention.